A NASA spacecraft orbiting the asteroid Vesta is revealing new details about the huge space rock's surface, including a massive mountain that rises taller than Mt. Everest on Earth. "We are learning many amazing things about Vesta, which we call the smallest terrestrial planet," Chris Russell, principal investigator of the Dawn mission, said in a statement. "Like Earth, Mars, Venus and Mercury, Vesta has ancient basaltic lava flows on the surface and a large iron core … The south polar mountain is larger than the big island of Hawaii, the largest mountain on Earth, as measured from the ocean floor. It is almost as high as the highest mountain in the solar system, the shield volcano Olympus Mons on Mars." Dawn also revealed that Vesta's surface appears to be much rougher than most asteroids in the main asteroid belt, which is a vast region full of space rocks between the orbits of Mars and Jupiter. Additionally, preliminary estimates of crater age dates on Vesta suggest that regions in the southern hemisphere are far younger than in the north — with some areas in the southern hemisphere only about 1 to 2 billion years old. The findings were presented today at the 2011 European Planetary Science Congress and the Division for Planetary Sciences Joint Meeting in Nantes, France. The $466 million Dawn spacecraft entered orbit around Vesta on July 15, beginning a yearlong mission to orbit and study the asteroid. After a year of studying Vesta, the Dawn probe is expected to head off to explore Ceres, the largest asteroid in the solar system. Vesta, which measures about 330 miles (530 kilometers) across, is the second-largest object in the main asteroid belt and is the brightest asteroid in our solar system. The surface of Vesta provides scientists with clues into the space rock's past. Since July, Dawn has been moving steadily closer to Vesta, transitioning into a polar orbit as it scans the asteroid's surface. In mid-August, the probe mapped the entire sunlit surface of Vesta in visible and infrared wavelengths. The spacecraft has since moved into a lower orbit and will spend the coming month mapping the asteroid's sunlit surface at a different resolution, said Carol Raymond, Dawn's deputy principal investigator. 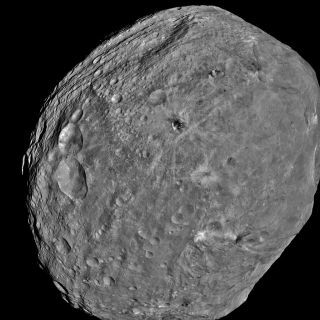 Scientists are now closely studying Vesta's craters, ridges and hills, and hope to have the sunlit surface of the asteroid completely mapped by the end of the year, Russell added. Dawn's framing camera is equipped with seven color filters that collect spectral information that enable scientists to show surface features in false color maps that would not normally be visible to the naked eye. These false colors are ratios of light intensity at different wavelengths, and are indications of different surface materials. "Data from different wavelengths can be combined to investigate different types of materials," said Maria Cristina de Sanctis, of Italy's National Institute for Astrophysics, which manages Dawn's Visible and Infrared Mapping Spectrometer (VIR). "The color variations seen by VIR suggest variability in the surface mineralogy." Researchers also said that the difference in the number of craters in the northern hemisphere compared to the southern hemisphere is also striking. The relative ages of the craters and regions can be roughly calculated by counting the number of craters per unit area in the different terrains. Early estimates show that areas in the south may be much younger than in the north. The oldest ages that have been found in the south so far are younger than 4 billion years old, which was surprising to the researchers since meteorites from Vesta were calculated to be about 4 billion years old. But, the ages of Vesta's craters should become more precise as Dawn continues its yearlong mapping mission, the scientists said. "The variation in Vesta's brightness as the sun angle changes indicates that the surface of Vesta is very rough, causing light to scatter," Raymond said in a statement. "This roughness could be at the scales of surface features or at the scale of individual minerals in the rocks, or both. Vesta's roughness is larger than most asteroids in the main asteroid belt." NASA's Dawn probe has only just begin its mission to map Vesta, and should continue to study the asteroid through mid-2012 before continuing on to its next target: Ceres. Dawn is expected to arrive at Ceres in February 2015.